Payment Data Systems, Inc. (NASDAQ:PYDS) is an unusual, undervalued small cap company. It is not as undervalued as it appears at first glance, and its unusual business makes it difficult to assess, but there is value here. At $2.90, the company has a market capitalization of $35 million. Its $65 million in net cash put its enterprise value at -$30 million. With positive operating earnings of $2 million over the last twelve months, the company trades on an acquirer’s multiple of -12.6x. It also trades on a PE of 6.2, and has generated free cash flow / EV of -14 percent (positive free cash flow of $4.2m on a negative EV of -$30 million). The net cash position here is a little misleading because PYDS carries a current liability called “Customer deposits payable” in the amount of $61 million that balances the $65 million in net cash. Adjusting for the Customer deposits payable liability, PYDS’s net cash position shrinks to $4 million, its enterprise value swells to $31 million, and its acquirer’s multiple blows out to 15x, which makes it too expensive to feature in the top 30 in the Small and Micro Screener. One interesting note: If I test the screen backing out all current liabilities from net cash to eliminate companies like PYDS, the screen underperforms the usual acquirer’s multiple screen by almost 2 percent per year (1.71 percent per year, to be precise). Clearly, cash on the balance sheet–even cash balanced by a current liability–has value. That’s the case here, even if PYDS has some other problems. Payment Data Systems, Inc.was founded in 1998 and is headquartered in San Antonio, Texas. It provides integrated electronic payment processing services to merchants and businesses in the United States. The company offers various types of automated clearing house (ACH) processing, and credit, prepaid card, and debit card-based processing services. Its ACH processing services include Represented Check, a consumer non-sufficient funds check that is represented for payment electronically rather than through the paper check collection system; and Accounts Receivable Check Conversion, a consumer paper check payment, which is converted into an e-check. The company also offers merchant account services for the processing of card-based transactions through the VISA, MasterCard, American Express, Discover, and JCB networks, including online terminal services accessed through a Website or retail services accessed through a physical terminal. In addition, it provides a proprietary Web-based customer service application that allows companies to process one-time and recurring payments through e-checks or credit cards; and an Interactive Voice Response telephone system to companies, which accept payments directly from consumers over the telephone using e-checks or credit cards. Further, the company creates, manages, and processes prepaid card programs for corporate clients to issue prepaid cards to their customer base or employees; and issues general purpose reloadable cards to consumers as an alternative to a traditional bank account. Additionally, it operates billx.com, a consumer Website that provides bill payment services; and offers iRemote Pay, a mobile payment application designed for merchant customers for a remote wireless point-of-sale application to accept credit cards, debit cards, ACH, and cash payments. The company markets and sells its products and services directly, as well as through non-exclusive resellers. PYDS appears to have some problems on the safety front. Its F Score at 6/8 indicates that it is fundamentally strong, but its Z score and M score indicate something potentially amiss. PYDS’s Z score at -0.26 indicates financial distress. In this instance it’s PYDS’s unusual financials fooling the Z score indicators. Its main problem is its huge retained losses– -$49 million–on total assets of $71 million. But PYDS is net cash (even accounting for the Customer deposit liability) and generating free cash flow, so I don’t think it’s actually financially distressed. If anything, the net operating losses (NOLs) are a benefit, offering a large shield against future tax. PYDS’s other problem is its M score, which at -0.03, indicates the presence of earnings manipulation. Its main issues are gross profits slipping year-on-year on increased revenue, asset quality deteriorating and slowing depreciation relative to PP&E year-on-year. Again, this is PYDS’s unusual financials tripping up the metric. The large net cash position and balancing customer deposit liability relative to the other assets makes the company very sensitive to movements in this relationship. For example, companies sometimes slow the rate of depreciation to boost earnings. For PYDS, depreciation actually increased fivefold from $39K to $199K, but PP&E increased 25-fold year-on-year from $132K to $3.2 million, which makes the metric look ugly, but isn’t out-of-the-ordinary for a rapidly growing business with depreciation lagging asset growth. PYDS is an unusual business with unusual financials, and these odd relationships are flagged by the Z and M scores. Examining the metrics in detail shows that it is the unusual business and financials themselves, rather than manipulation or distress, that raises the flag. 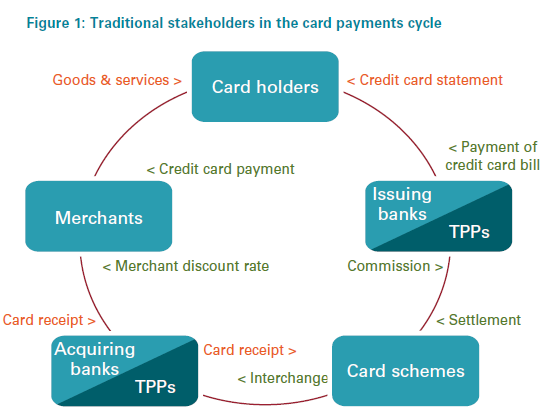 Traditionally, there have been five major stakeholders in the payment ecosystems: cardholders, merchants, acquiring banks, association networks, and issuing banks. The “merchant” receives the payment from the “cardholder” (customer) swiping the card at the point of sale (customer-present), the bank that the merchant uses to provide processing services (“acquiring bank”), the bank that issued the card to the customer (“issuing bank”) and association networks such as Visa (NYSE:V), MasterCard (NYSE:MA), American Express (NYSE:AXP). On one side are bankcard issuers and their customers who hold consumer payment cards, and use their credit, debit, and prepaid cards to make purchases at merchants. On the other side, merchant banks or, as is many times the case, their merchant acquiring or processing partners who process consumer card payments into payment card networks on behalf of merchants. Together, merchant acquirers and processors serve as the communications and transactions link between the merchants and the card issuers. Every card issuer deals with at least one payment processor, and every merchant that accepts cards has a relationship with a merchant acquirer. Without them, the payment system as we know it would not exist. Over the past five years, revenue has grown by 33 percent, from $3.2 million to $13.4 million at the end of FY14, driven primarily by adding merchant accounts. Merchant accounts have grown from 482 in 2009 to 795 at the end of FY14, with one customer accounting for 11% of total sales. The company hit a roadblock in 2013, as lower ACH transaction volumes and pre-paid card volumes were down, resulting in reduced overall revenue. PYDS acquired Akimbo Financial for $3.0 million in December last year, with speedy and successful integration now contributing to the top-line. For the recently completed 2nd quarter, PYDS’s top-line revenue grew 4% to $3.42 million, against the backdrop of higher transaction volume in credit card, debit card, and ACH processing. Gross profit grew 5% y/y while operating income declined primarily due to charges associated with listing the company on NASDAQ, and including two independent directors to the board of directors. Credit card dollars processed during Q2 were up 9% y/y while the transactions processed were up 6% y/y. Cash flow from operations excluding customer deposits was $1.3 million. Total dollars processed for the Q2 exceeded $806 million and is the second highest in the history of the company for any previous quarter. However, the company expects revenue growth to accelerate in Q3 and Q4 of 2015, with further growth in Q1 and Q2 of 2016. Specifically, the Company is targeting 10-20% quarterly growth in revenue beginning in 2016. The Company expects its 2015 gross margins to be 35-40%, more in line with how it started this year and net profit margin (before tax) to be 10-15% for the year ending December 31, 2015. The Company also expects to see revenue growth in 2015 with the growth accelerating in 2016. PYDS reported transaction processing volume of $309 million, equating to an annual rate of $3.7 billion in processing dollars. Using management’s guidance, Revenue projection of $15.5-$16.5 million for FY 15 seems reasonable, which translates into processing revenue of 5 bps per transacted dollar. With the industry average cost of processing a payment at about five to eight bps per transacted dollar, according to McKinsey estimates, it certainly is an impressive feat for a company this size. PYDS is fulfilling the needs of the customers, which often remain ignored by the larger players in space, and by preserving their cost base low enough PYDS can produce profits from serving such low volume customers. By successfully leveraging customer relationships and fulfilling customer requirements with post-sales support, PYDS is quickly expanding its merchant account base upwards. Also, by integrating certain proprietary infrastructure components, it builds a customized electronic payment service tailored to customer’s specific needs, and captures cross-selling opportunities between merchant business and pre-paid business, which as we stated earlier remains underestimated. Besides adding more merchants in its customer base and acquiring Akimbo, we note for 2014 PYDS’s tax expense (benefit) was ($1.48 million) , primarily the result of PYDS recognizing deferred tax benefit of $1.62 million , net of alternative minimum tax and Texas margin tax. PYDS has net operating loss carryforwards of about $40.8 million, which expire beginning in the year 2020, despite being profitable for FY14 with a total net income of$3.8 million. The company has recorded a valuation allowance reserve of $12.2 million, that we figured, was most likely created due to PYDS’s history of operating losses limiting any visibility on when if some or the entire deferred tax asset will be realized. However, PYDS has been profitable for three out of the past four years; we think it has accumulated sufficient objectively verifiable evidence to reverse this valuation charge. We believe, this reversal will significantly boost PYDS FCF for the next five years. Basically, if PYDS were to maintain its profitability at the same levels as trailing twelve months ($3.9 million) for the next five years, we estimate PYDS can generate FCF north of $3.5 -$4.0 million per year comfortably, after factoring in its NOL’s. Readers should note that this back of envelope estimate doesn’t factor any margin improvement opportunity. Given PYDS’s low coverage and the catalysts that abound in the name, we are going to shun relative valuation techniques, and instead purely focus on its valuation in its pure absolute terms. Below is the table, which succinctly illustrates, PYDS’s earnings power near $3.75 million, which we strongly believe can comfortably grow to near $6 million by FY19. An under the radar business that yields FCF north of 10 %, not bad in our opinion, considering we embrace a owner mindset with a long term focus. Kindly note, in these projections, we have not yet incorporated any benefits PYDS can incur if Federal Reserve elects to lift the federal funds rate. Here, we have a business with a clean balance sheet, no debt overhang unlike its larger peers, with a clear visibility to future earnings power, positioned to benefit from interest rate hikes, remains insulated from the vagaries of exchange rate fluctuations, and yet trades at a considerable discount to its true value. We believe, PYDS shares are currently undervalued by a wide margin and are worth at least $5.20 per share. Brodie Hinkle, a senior at the University of Oklahoma, is a contributor to the Acquirer’s Multiple. Brodie is a double major of finance and energy management. He will be periodically writing opinionated articles about individual companies that show up on the stock screeners. If you’d like to contribute an article, please contact me at tobias@acquirersmultiple.com. Contributors receive complimentary access to the screeners. Today I would like to do a lightning round to touch on the top 3 ranked Micro/Small Cap stocks according to Tobias Carlisle’s screener on www.acquirersmultiple.com. Little known information can generally be found on each stock of this particular capitalization window, therefore, I have taken the initiative to dig into these company’s’ financials and search for untapped growth opportunities. My final goal is to educate and provide illustrations as to how these companies generate their revenue, as well as, what makes them unique to their industry. First, Enzon Pharmaceuticals Inc. (ENZN) is a $42.9 million capitalization company that generates revenues through the sales of four main drugs: PegIntron®, Sylatron®, Macugen® and CIMZIA®. All of Enzon’s products have the general theme of combating life-threatening viruses, cancerous agents, and various forms of arthritis. Enzon’s largest revenues come from their product, PegIntron®, which is marketed by the pharmaceutical powerhouse, Merck & Company. Prior to 2013, ENZN spent much time, effort, and capital to generate high-quality drugs through their R&D Department. Enzon believes the creation of their four primary drugs has created a healthy stream of revenues for the foreseeable future, in which they are not currently working on any further products and do not plan to do so for now. From an investment standpoint, I see this as both a strength and weakness. Due to the elimination of R&D efforts, all operating expenses are at a minimum, which makes ENZN an efficient company that is sitting on streams of royalty revenue. In contrast, it is alarming that ENZN is not working to expand their product base in order to create larger streams of revenue. As a $42.9 million capitalization company, Enzon has a ton of room for growth and expansion if they were to fixate their efforts on creating more value for the company. From a financial standpoint, ENZN is generating very fat returns, with a P/E of 1.8, in comparison to the industry average of 35.5. Their P/B is 2.4, in comparison to the industry average of 7.6. Furthermore, ENZN’s D/E is 0.167. In conclusion, Enzon essentially keeps every dollar they earn from sales. Of the $31 million in revenue they collected last year, $29 million went into retained earnings. ENZN is a relatively simple company and we see them as a viable option for investment for the foreseeable future. Second, Sino-Global Shipping America, Ltd (SINO) is a $6.9 million corporation with most recent annual sales reaching $11 million for the year ending June of 2015. Sino-Global is a shipping agency, which offers logistics and ship management services. Their most viable services include shipping agency services, shipping and chartering, inland transportation management, and ship management services. The bulk of SINO’s revenues are derived from clients located in the People’s Republic of China and Hong Kong. Recently, SINO acquired Longhe Ship Management, a ship management company based in Hong Kong. Sino-Global has steadily increased their profitability and efficiency in recent years. Furthermore, SINO’s total assets and equity have consistently increased, providing shareholders with more value. A few prevalent risks come to surface when viewing SINO’s financials. The company’s size, $6.9 million, is of concern for both volatility and liquidity purposes. If a large investor were to purchase/sell large lump sums of SINO shares, it would be of prudent practice to use a limit order on the transaction. Also, it is of concern that SINO’s revenues have dwindled over time. We would like to see Sino-Global revamp their sales program to build clientele so that shareholders could reap the rewards from revenue growth. SINO has a current P/E of 7.4, which is a strong return in relation to its peers P/E of 25.8. Furthermore, Sino-Global has a P/B of 0.5, compared to the industry average of 5.5. Overall, SINO is a risky play, but we could see this company turn operations around to create profitable opportunities for shareholders. Lastly, G Willi-Food International Ltd (WILC) is a $58.9 million capitalization company with annual revenues of $329 million. WILC develops, imports, exports, markets and distributes food products. G Willi-Food specializes in food products consisting of canned vegetables, packaged fruits, pickled vegetables, pasta, and cooking oils. G Willi-Foods is most popular in Asia, but has indeed penetrated into the American markets. For instance, G Willi-Food owns the brand Del Monte, which is a major supplier of canned fruits and vegetables. WILC owns 14 very strong brands that effectively pierce into global markets, providing canned food to numerous consumers. From an investment standpoint, it is very attractive to see this company expanding its reach throughout global markets, which develops widespread opportunities that result in continued growth. WILC has done a fantastic job increasing both asset and equity totals for shareholders. They currently possess a P/E ratio of 23.3, which is strong in comparison to the industry average of 29.8. Also, WILC’s P/B ratio is 0.6 in comparison to the industry average of 3.3. We see G Willi-Food as a strong candidate for investment due to its global presence and strong brands. Throughout all stages of the economic cycles, we see WILC continuing to generate strong sales due to their particular position within the industry. As is a theme in the micro/small capitalization stocks, we see risks deriving from the particular size of WILC, but in conclusion we see fantastic opportunity for investment. In conclusion, we see Enzon, Sino-Global, and G Willi-Food as great candidates for investment. Tobias Carlisle has done a fantastic job laying out the foundation of quant value investing through means of the Acquirer’s Multiple, and these three positions illustrate compelling opportunities in compliance to Tobias’ benchmarks. We would like to forewarn all investors that the micro/small capitalization sector of stocks will endure volatile market swings. Therefore, investors must thoroughly understand ones risk tolerance prior to executing positions into this market capitalization sector. I love it when I get the chance to write about a high-profile stock, particularly when it’s owned by David Einhorn–one of the smartest guys around–and it’s dirt cheap. Poor old Micron Technology, Inc. ($MU). I’ve bought and sold it so many times over the last decade. It was a net net in 2009 before running away. It got cheap on an acquirer’s multiple basis (and close to net net territory) in 2011 and again in 2012 before running away. And here we are again. It’s cheaper now than it has been at any time in the last two years, down 60 percent (!) from its 52-week high, and 8 percent from its 52-week low. At the time of writing MU’s trading at $14.56, putting it on a market cap of $15.7 billion. Add in the $3.6 billion of net debt and its enterprise multiple swells to $19.3 billion. On trailing twelve month operating earnings of $3.4 billion, it trades on an acquirer’s multiple of just 5.7x. It’s cheap on other measures too: The PE ratio is a paltry 5, and free cash flow / enterprise value yield is 11 percent. It’s a net issuer of stock to the tune of 2 percent over the last twelve months, and doesn’t pay a dividend, both of which are less than ideal. Micron Technology, Inc., founded in 1978 and is headquartered in Boise, Idaho, manufactures semiconductors. The company sells dynamic random access memory (DRAM), NAND flash, and NOR flash memory products; and packaging solutions and semiconductor systems. It operates in four segments: Compute and Networking Business Unit, Mobile Business Unit, Storage Business Unit, and Embedded Business Unit. MU markets its products to original equipment manufacturers and retailers. MU’s a reasonably safe company, scoring well on the Z, F and M scores–the statistical measures I like to examine to detect fundamental strength, financial distress, and earnings manipulation respectively. MU scores worst on its Altman Z-Score. At 2.43, it is in the grey zone, which means it is not financially distressed (below 1.81), but neither is its clearly safe (above 2.99). MU has seemed to flit between distressed and safe over the last decade with no appreciable damage, but it’s worth watching. Its Piotroski F-Score is 6 of 9, which indicates fundamental stability. Its Beneish M-Score of -2.68 indicates the company is not an earnings manipulator (less than -2.22 is not a manipulator). Taken together, MU is in reasonably good shape, but its debt load and financial distress grey zone mean that its safety isn’t unalloyed. Most companies are still held accountable to current performance. Micron Technology (MU), which fell from $27.13 to $18.84 during the quarter, was our biggest loser. It’s a cyclical business and, regrettably, we missed the turn of the cycle. Long production lead times make it difficult to match supply with demand, and when demand falls short (as it has recently), shortages can turn into surpluses. Prices (and profits) fell, and MU disappointed. MU also had manufacturing problems that will impact earnings for the next couple of quarters. With only three remaining players, the industry is behaving more rationally. Manufacturers are redirecting capacity away from computer DRAM to other segments, and we believe that the excess computer DRAM inventory created earlier this year is now being absorbed. Our assessment is that MU shares have fallen too far. Peak quarterly earnings last year were $1.04 and we expect the cyclical trough to be around $0.40 in the August quarter. At $18.84, the company trades at less than 12x annualized trough earnings and less than 5x prior peak earnings. We expect future cycles will have higher peaks and higher troughs, as the technology story for both DRAM and NAND (including 3D memory) is bright for the next several years. Our long-term outlook is that sometime in the next few years, MU (currently valued at $20 billion with $3.7 billion of trailing net income) will be worth more than NFLX (currently valued at $40 billion with $240 million of trailing net income). It’s a contrarian view, but we don’t think the movie is over. Should it be rejected on national security grounds, as noted by Senator John McCain, Tsinghua could still ally with Micron to enable it to develop its sales in China while negotiating a production on Chinese soil of flash memory drives and other devices. The rumors are that if Tsinghua were to acquire Micron, it would pay some $21.0 billion. Micron has suffered over the past two years for the first time due to weaker demand for dynamic random access memory (DRAM) chips used in PCs. But it now has the new technology to benefit from the smartphone market as well as servers and other chips used as storage on mobile devices and computers. MU is imperfect. It carries a substantial slug of debt, is in a financial grey zone, doesn’t pay a dividend, and it’s a net issuer of stock. But it’s also very cheap, trading on an acquirer’s multiple of 5.7x, a PE of 5 and a FCF/EV yield of 11 percent. Einhorn makes mistakes, but he’s one of the smartest investors around and he’s very tenacious. MU announces earnings after the close today. I don’t know, but I’d guess that anything less than a disaster will be viewed very positively. We believe the semiconductor sector is bottoming, and we believe that stabilization of the sector will result in the company taking on as much as 50% upside from these levels. We also believe that genuine buyout interest in the company continues to exist at these compressed multiples. The company is going to be reporting next week, and we’re likely to get a firsthand look at why quantitative investors are drawn to Micron. The company is expected to post earnings of $0.35 on revenue of $3.567 billion. For the full year, the company is expected to earn $2.68 and even for next year, the company is expected to earn $2.20. 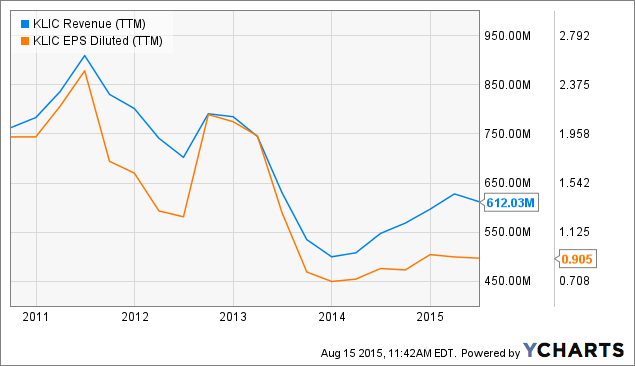 Despite the EPS decline, Micron still remains attractively valued from a fundamental basis. In addition to the earnings, the company’s balance sheet continues to get better and better. Management is setting up the company to withstand these types of ebbs and flows in the sector by building a company that’s rich in assets and resources and isn’t leveraged too far. The company now has a book value of $11.59 per share, with $4.8 billion in cash in the bank versus the $7.6 billion in debt that the company is carrying. The company has done about $5.5 billion in operating cash flow over the ttm period and it continues to generate, and then stock away, cash. From a valuation standpoint, the company is extraordinarily cheap. With a trailing 5.5x EPS and a forward EPS of 7.5x, it’s a race to try and buy cheap versus timing the decline and bottom of the semiconductor industry. We continue to think the company’s EV/sales of 1.2x and EV/EBITDA make it an attractive buyout candidate. You have to assume that there is genuine interest in buying out the company. The potential buyers of the Tsinghua group are legitimate buyers that have shown enough interest in buying the company to make a trip to the United States in order to discuss it. This is a question of whether or not the company’s valuation is going to get low enough for people to buy the company while the market continues to be in decline. I had great fun chatting to Stig Brodersen about deep value investing and the acquirer’s multiple. We cover a lot of ground. Get a free list of deep value stocks likely to be targets on The Acquirer’s Multiple. The price-to-earnings (P/E) ratio is perhaps the most popular valuation metric used by investors. Pull up any finance website stock quote page, and you’ll find the P/E ratio neatly calculated for you. The reason it’s so widely used is because it’s simple and intuitive. You take the price of a stock and divide it by either trailing or forward (estimated) earnings per share (EPS). The lower the resulting figure, the better the valuation, all else equal. But the P/E ratio has some significant flaws. One of its biggest weaknesses is that it ignores the level of debt on a company’s balance sheet. This is critical right now because so many companies are issuing debt to buy back stock or acquire other firms. Now, there is a better metric we can use to assess a firm’s total valuation – not just its equity component. It’s a bit more complicated, but as you’ll see, a little extra work is definitely worth the effort. The valuation metric I’m referring to is the enterprise value-to-EBITDA ratio. This gives us a theoretical takeover value, which is similar to how an investment banker might value the company. The denominator of the ratio is EBITDA, which stands for earnings before interest, taxes, depreciation and amortization. Basically, it’s the earnings that are available to all stakeholders. Similar to the P/E ratio, a lower EV/EBITDA represents a cheaper valuation, all else equal. Luckily, the EV/trailing EBITDA ratio can be found on the Yahoo! Finance Key Statistics page, so we don’t have to dig through financial statements. 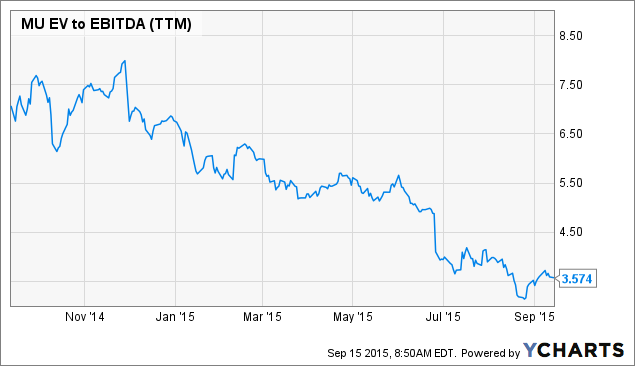 The EV/EBITDA ratio could be the single-best valuation metric around. 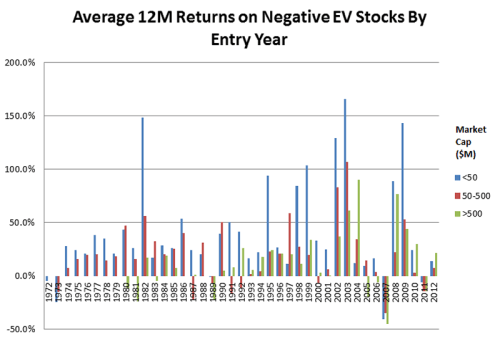 Academic research has shown that stock selection based on EV/EBITDA outperforms P/E and price-to-book value methodologies on a risk-adjusted basis. 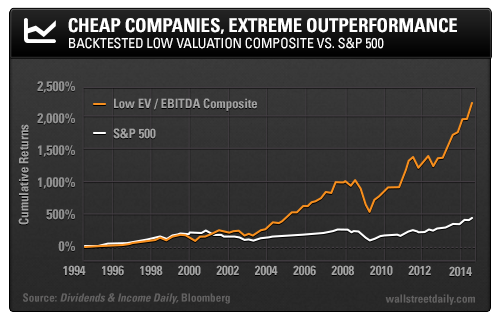 Using a Bloomberg backtest, we can see how a simple strategy based on low EV/EBITDA would have performed in the past. Each quarter, S&P 500 companies with EV/EBITDA ratios ranking in the lowest 10% are placed into the Low EV/EBITDA Composite, which is market cap weighted just like the S&P 500. So what happens when you invest in just these companies with low EV/EBITDA ratios? With a return of 2,227% over the past 20 years, this strategy has simply blown away the S&P 500. Cheap companies outperform over time, plain and simple. 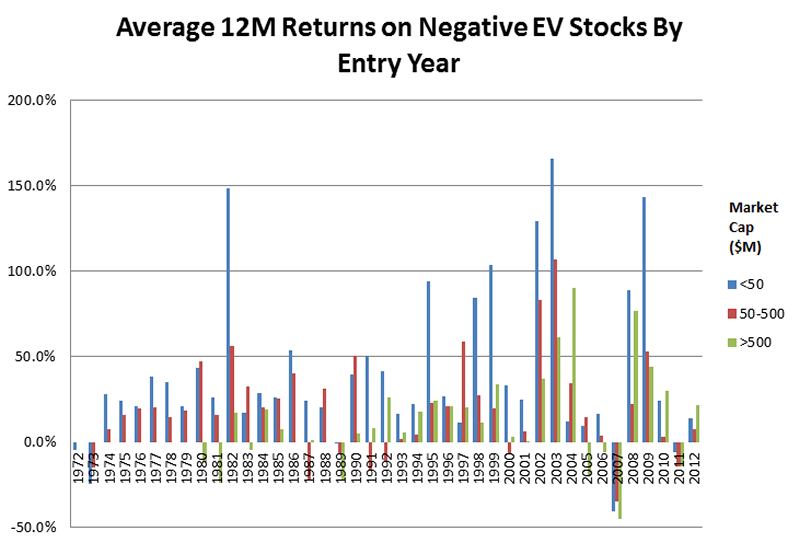 If you haven’t been using EV/EBITDA as a guide, now is a great time to go through your portfolio and look up this crucial metric for each of your stocks. The median EV/EBITDA ratio for the S&P 500 is currently 11.4x. If we own a stock with a much higher multiple, there better be a really good reason. Of course, the ultimate goal is to select stocks with both low EV/EBITDA ratios and high dividend growth. Now that’s the basis for a powerful strategy and the key to an early retirement! LG Display Co Ltd. (ADR) $LPL is another super cheap company in the All Investable Screener offering substantial upside. The stock has been beaten up over the last twelve months, falling almost 50 percent from its 52-week high of $18.43. At its $9.64 price at the time of writing, the stock has a market capitalization of $6.9 billion. Its net debt to the tune of $1.7 billion pumps up its enterprise value to $8.6 billion. With operating earnings over the last twelve months of $2.1 billion, LPL trades on a very modest acquirer’s multiple of 4.13x. With a PE of 5.46, a free cash flow / enterprise value yield of 10 percent, and a 2.2 percent dividend yield, LPL is cheap across the board, and worthy of a closer look. LG Display Co., Ltd., founded in 1985 and is headquartered in Seoul, South Korea, manufactures and sells thin film transistor liquid crystal display (TFT-LCD) panels in Korea, the U.S., Europe, and Asia. It offers various display panels comprising large-sized panels for use in televisions, notebook computers, and desktop monitors; and small-sized panels for other application products, such as mobile phones and tablet computers. The company also provides panels for industrial and other applications, including entertainment systems, automotive displays, portable navigation devices, and medical diagnostic equipment, as well as organic light emitting diode panels and flexible display products. LPL sells its products directly to end-brand customers and their system integrators. The company was formerly known as LG.Philips LCD Co., Ltd. and changed its name to LG Display Co., Ltd. in February 2008. LPL is a safe stock on the metrics I favor. Its F-Score, which examines its fundamental strength, is a perfect 9. Its Z-score, at 2.76, puts it in the grey zone, which is appropriate given its debt load, but it is close to the >2.99, which would indicate an absence of financial distress (a Z-score below 1.81 indicates financial distress). Its M-Score, which measures earnings manipulation, is a healthy -2.99. Vaunted as the next-gen display technology, OLED boasts of improved brightness, contrast and efficiency as compared to LCD or Plasma. However, OLED is said to highly expensive to be used for manufacturing TVs and thus Samsung Electronics Co. Ltd. SSNLF – the TV maker giant – reduced its exposure to OLED TVs way back. Presently, LG display and its sister concern LG Electronics are the only major players that are carrying the technology for TVs on their strong shoulders amid improving OLED market prospects. As per IHS DisplaySearch, a global market research firm, the flexible OLED market is expected to thrive from 2015, with projected sales to increase to $4.8 billion by 2021 from $3.5 billion in 2015. We believe on the back of such vigorous and dedicated efforts, LG Display can break all odds and emerge as a leader in the OLED market. But that also raises the question: Why is LG Display willing to strike such a seemingly sour deal with its Chinese counterparts? It’s all about jump-starting demand for the OLED TV market, which LG Display views as the future of display technology and wants to ensure it continues to lead. To be fair, however, just last week Panasonic unveiled its own curved 65″ OLED television, and recent reports suggest Samsung — which effectively shelved its large OLED panel development following manufacturing challenges last year — remains committed and will reenter the OLED TV market by 2017. But for now, the primary problem is one of manufacturing capacity and, therefore, prohibitively high prices for OLED TVs. LG’s latest 55″ curved OLED television (pictured above), for example, currently sports a suggested retail price of $5,000. Though older models sell for considerably less, that’s hardly competitive in many consumers’ eyes. Because of the small capacity, there are limitations in the number of OLED TV panels we can produce. We have to ultimately reach economy of scale but we’re not there yet. This isn’t something that a panel maker can do single-handedly. Participation from multiple players is needed for addressing problems like cost reduction and product competitiveness. I believe other panel-makers are working on developing OLED panels as well. It’s just a matter of time before competitors jump in. LG Display is also working hard to expand its OLED manufacturing capabilities and increase production yields. In addition to more than tripling production at its current Gen-8 OLED manufacturing line by the end of this year, just last month LG Display announced it will invest a whopping 10 trillion won, or $8.5 billion, to shift LCD manufacturing operations to OLED over the next three years. We believe we are now trawling along the trough of the crystal cycle, which will likely lead to industry moves to constrain supply, triggering a moderation of panel price declines, and an upward rerating of the stocks. We therefore take a more “constructive” view and upgrade our coverage to Outperform. To be clear, we are not saying “this time is different”, and that we’re structurally more positive on the sector. Far from it. But the conditions for a long trade on some inexpensive stocks seem to be coalescing. We are now expecting companies to react to weakened industry conditions by cutting back utilization rates and begin moderating the rate of supply growth in Q4 2015 and into 2016. – It is worth noting that both AUO and LGD mentioned during their recent earnings conference that they will adjust utilization rates according to market demand, which is a rare and cautious tone from the companies. As we highlighted in our previous work, panel makers are usually unwilling to be the first to cut utilization rates than competitors. Management’s comment on utilization indicates that the industry sentiment is likely at the bottom. – Current stock valuations imply that LGD, AUO, and Innolux will report net margins of -5.8%, -7.7%, and -7.6% in 2016 respectively, which would mean EBITDA margin compression of ~10 percentage points from current levels. This is close to 2011 trough levels when the industry was at utilization rate of 60-70% (vs. currently ~85-90%). Given recent cycle trough margin compression trends, we think this is too pessimistic, and believe further de-rating of the stocks to be unlikely. The thin-film-transistor liquid-crystal display (TFT-LCD) stocks in our coverage have rerated downward well below our breakup value-estimated target prices. Hence, we upgrade LGD, AUO, and Innolux to Outperform. Given the uncertainty on the timing and strength of the ASP catalyst, we retain our current target prices for all three companies. – LG Display’s valuation has de-rated the earliest since the beginning of 2015, from above 1.1x P/BV to currently below 0.6x P/BV. We had recently upgraded the company to Market-Perform. However since then the stock price declined to well below what we believe to be the “breakup” value, and is now materially undervalued. We believe we are at the bottom of the crystal cycle and the stocks are more than incorporating expectations for a terrible Q4 2015 and an overall weak 2016. Hence, there is sufficient margin of safety between current valuations and our target multiples to upgrade the stocks now. We do acknowledge that there is some risk on the timing of when the “price moderation” catalyst kicks in and how quickly it leads to more positive investor sentiment. We upgrade LG Display to Outperform, while maintaining our Target Price of KRW 28,000 ($13.18 for the ADR LPL), as we believe the stock is currently undervalued relative to our trough multiple valuation. LG Display usually has the highest valuation and re-rates first, given its liquidity, investor focus, financial strength, and capability for technological improvement that peers are unable to replicate. When researching the Large Cap 1000 Screener on the Acquirer’s Multiple website (www.acquirersmultiple.com), you will see Western Refining Inc. (WNR) as a top pick according to the value metrics laid out by Tobias Carlisle. Western Refining is a small oil and gas refiner in relation to domestic peers, having only two refineries. Western Refining operates their two refineries at full capacity, processing 151 mbbl per day. WNR also owns a 38.7% stake in Northern Tier Energy, which operates a refinery in Minnesota. At current, we see several compelling objectives that make Western Refining a prospect for investment. First, WNR is geographically competitively positioned, which results in wide margins. As initially stated, WNR has a refinery in close proximity to the Permian Basin. Therefore, Western will obtain wider margins due to the decrease in transportation costs from field to refinery. According to Morningstar, Western Refinery benefits by $5 to $6 per barrel due to the transportation savings. Furthermore, the Permian is one of the best producing plays domestically, which oversaturates the supply for its region, as well as, worldwide. Furthermore, the Permian has shown staggering production growth year over year on a field-wide basis. According to the EIA, the Permian Basin is currently producing about 2 million barrels per day, in comparison to 800,000 barrels per day in 2007. As the Permian continues to increase production, pipeline infrastructure, and logistics technology, we estimate climbing revenues for WNR in response. Moreover, Western Refining will conclusively receive raw crude at a discount in relation to the current spot price on WTI. Also previously stated, WNR owns a large stake in Northern Tier (NTI), a variable distribution MLP in Minnesota. The refinery is built to cultivate both domestic light crude, as well as, Canadian heavy crude. NTI’s refinery currently processes an average of 89.5 mbbl per day. It is a probability that Western Refining will enhance the productivity of their refineries through enabling variable grades of crude. Bottom line, Western Refining is very well positioned geographically, and will continue to receive discount crude at full capacity throughout the foreseeable long-term horizon. Second, raw quantitative figures for WNR are stunningly impressive. For example, Western Refining is currently operating at a 20% return on capital due to their sustained feedstock from the Permian and Canada. As WNR reinvests retained earnings into new projects, we expect to see Western Refining’s ROC ever increasing. Greater margins will be employed through the implementation of new logistics projects, which cut down on transportation costs. Furthermore, we expect to see an expansion of allowable capacity into current refineries operated by WNR. A boost in capacity would be a relatively inexpensive investment and would drive revenues higher. Likewise, WNR has a P/E of 8.1, which is a positive indicator of value since WNR’s 5-year average P/E is 16.6. WNR also has a dividend yield of 2.9%, which is slightly above the average S&P dividend yield of 2.3%. Conversely, it is prudent advisory to understand the underlying risks that Western Refining may face in the foreseeable future. There are two primary risks that could inhibit future revenues: commodity pricing and adverse weather conditions. Although Western Refining is currently benefitting from the oversupply of crude in the Permian, there is always the possibly of supply racing back to meet demand. If demand would happen to overrun supply, Western Refining will tighten margins in the event due to competitive bidding campaigns amongst producers and refiners. Additionally, adverse weather conditions, such as hurricanes, may inhibit affected refineries from potentially operating for a period of time. Anytime severe weather is expected within the general area of a refinery, it is a safety standard to shut down the site due to precautionary purposes. We must also include the risk of future approval for crude exports. A lift on exports would increase refining competition, resulting in condensed margins. Lastly, as the legislation is always tightening environmental emission tolerances, there is the possibility of further tightening of carbon dioxide emission tolerances. Carbon dioxide is a byproduct of refineries; therefore, a tightening of tolerances would increase expenses for Western Refining. In conclusion, we view WNR strategically placed as a buy for our portfolio. Western Refining’s strengths outweigh all current weaknesses, which offers a statistically viable opportunity for investment. The long-term prospectus of WRN appears favorable due to all reasons mentioned above. Lastly, Morningstar is valuing WRN at $50 per share, which calculates to an 11% premium to the current market price of $45.00. At $61.69, Valero Energy Corporation (NYSE:VLO) is a particularly cheap large capitalization stock, trading on an acquirer’s multiple of 4.68x. It’s market capitalization is $30.8 billion, and its net debt position at $2.1 billion gives it an enterprise value of $33.0 billion. In the last twelve months it generated operating income of $7.0 billion. It has generated a fat free cash flow on enterprise value yield of 12 percent, and has put that to good use, buying back 5.7 percent of its stock, and paying a 2.2 percent dividend yield for a total shareholder yield of 7.9 percent. VLO scores well on its F, Z, and M scores: F-Score: 7 (fundamentally strong), Z-Score: 4.39 (not in financial distress), M-Score: -3.23 (not a manipulator). We’ve covered it a few times here. The space is getting some love from Warren Buffett, who recently bought another 3.51 million shares in Phillips 66 (PSX) to bring his total to 61.5 million shares: 11.4 percent of the company. VLO was founded in 1955 and is based in San Antonio, Texas (It was formerly known as Valero Refining and Marketing Company and changed its name to Valero Energy Corporation in August 1997). It’s an independent petroleum refining and marketing company in the United States, Canada, the Caribbean, the United Kingdom, and Ireland. It operates through two segments, Refining and Ethanol. The Refining segment is involved in refining, wholesale marketing, product supply and distribution, and transportation operations. This segment produces conventional and premium gasolines, gasoline meeting the specifications of the California Air Resources Board (CARB), reformulated gasoline blendstock for oxygenate blending, diesel fuels, low-sulfur and ultra-low-sulfur diesel fuels, CARB diesel fuel, distillates, jet fuels, asphalts, petrochemicals, lubricants, and other refined products. The Ethanol segment produces and sells ethanol and distillers grains. The company markets its refined products through bulk and rack marketing network; and through approximately 7,400 outlets under the Valero, Diamond Shamrock, Shamrock, Ultramar, Beacon, Texaco, and other names. As of December 31, 2014, it owned 15 petroleum refineries with a combined throughput capacity of approximately 2.9 million barrels per day. Valero also owns and operates 11 ethanol plants with a combined ethanol production capacity of approximately 1.3 billion gallons per year. This is an interesting take on Buffett’s interest in PSX and what it could mean for VLO from long/short equity, value investor David White. Valero Energy Corp. has been a strong company for many years. The stock has risen roughly 300% over the last five years; and its trailing twelve month PE is still only 7.06. 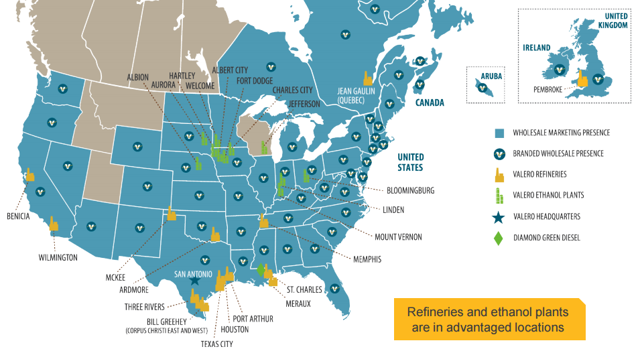 The picture below shows the locations of its refineries, etc. Since the US is producing more light sweet crude (about 9.5 million bpd in 2015) than it has in the recent past, one might think VLO’s higher complexity abilities might be useless. However, this is not true. The Canadian oil sands crude is heavy sour crude. Much of the crude from Iran, Iraq, and Saudi Arabia (and others) is heavy sour crude. In addition the US may be on the verge of allowing exports of US crude oil for the first time in a long time. These things would mean that VLO could do very well for itself by processing heavy sour crude from the above locations, while paying less than the WTI light sweet crude price. This would put VLO in the “catbird seat”; and it appears that this is exactly what will eventually happen. 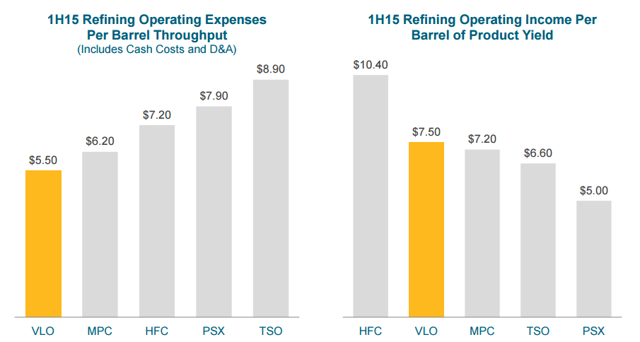 As investors can see VLO’s operating costs are already the lowest among its peers; and VLO’s Operating Income per barrel is nearly the highest among its peers. The new Enbridge pipeline project due to be completed in Q4 2015 should improve VLO’s results further. One should consider the Keystone XL pipeline too. The southern and the northern parts of this have already been built. The middle section would allow about 830,000 bpd of Canadian Oil Sands crude (heavy sour crude) to move from Alberta to the US Gulf Coast. The remaining piece of this pipeline got Congressional approval in 2015; but it was vetoed by President Obama. Still Obama will be out of office in less than 1.5 years. The State Department study to evaluate whether the Keystone XL pipeline was in the best interest of the US should be done before that. The study is the excuse Obama used for vetoing the bill. The Senate didn’t have enough votes to override Obama’s veto; but Congress is sure to propose another bill as soon as the State Department study is done. Virtually everyone thinks this study will find that the Keystone XL pipeline is in the long term best interest of the US. If the US sees a recession in 2016, that too could push Congress and Obama to gain approval for a pipeline that will also create a lot of new jobs (42,000 in one estimate). A lot more heavy sour Canadian Oil Sands Crude being able to reach Texas could only help high complexity refiner VLO. VLO should then be able to demand still lower Arabian heavy sour crude prices. It should be able to use less WTI light sweet crude (more expensive than sour heavy crude). This should lead to more profitability for VLO. Berkshire Hathaway (NYSE:BRK.A) (NYSE:BRK.B) (“Warren Buffett”) recently bought another 3.51 million shares in Phillips 66 (NYSE:PSX). This brings its total to 61.5 million shares — 11.4% ownership. Many consider VLO to be an even better company. If Warren Buffett is buying Phillips 66 , then some investors may wish to consider buying VLO. VLO had a good to great Q2 2015. EPS were $2.66 per share compared to $1.22 per share in Q2 2014. Refineries operated at 96% capacity. Plus it guided for a payout ratio of 75% of FY2015 Net Income. VLO returned $870 million in cash to shareholders in Q2 2015. $203 million was in dividend payments; and $667 million was used to repurchase 11.3 million shares of VLO stock. This made the total payout ratio for 1H 2015 61% of Net Income. If VLO is going to reach its “declared” 75% of Net Income payout target for FY2015, it will have to increase its payouts for 2H 2015 substantially from those of 1H 2015. This should help the stock price. For VLO the fundamentals are good. It does not have overly much debt with a Total Debt/Total Capital (MRQ) of 25.04%, a Quick Ratio of 1.20x, and an Interest Coverage of 28.29x. By comparison, Phillips 66 , the stock that Warren Buffet is buying for Berkshire Hathaway (BRK-B), has a Total Debt/Total Capital (MRQ) of 27.85%, a Quick Ratio of 1.23x, and an Interest Coverage of –. VLO has $5.76B in total cash, $7.35B in total debt, Operating Cash Flow (“ttm”) of $6.62B, and Levered Free Cash Flow (“ttm”) of $3.93B. By comparison PSX has $5.09B in total cash, $8.96B in total debt, Operating Cash Flow (“ttm”) of $4.08B, and Levered Free Cash Flow (“ttm”) of -$2.22B. In other words, VLO appears to be in better fiscal condition than PSX. 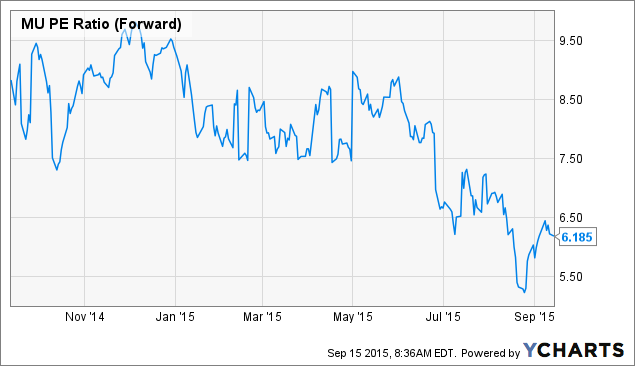 Hurco Companies, Inc. (HURC) is an interesting stock in the All Investable Screener. With a market capitalization of just $196 million it is one of the smaller stocks in that screener, but its $62 million in net cash makes its enterprise value even smaller again at $134 million. Operating earnings of $25 million put HURC on an acquirer’s multiple of just 5.37x. With a PE of 11.3x and a free cash flow to enterprise value yield of 16 percent, HURC is cheap on any number of measures. HURC is an industrial technology company founded in 1968 and is headquartered in Indianapolis, Indiana. It manufactures computerized machine tools for the companies in metal cutting industry primarily in North America, Europe, and the Asia Pacific. The company provides general purpose computerized machine tools, including vertical machining centers and turning centers, machine tool components and computer control systems for metal bending press brake machines. It serves precision tool, die, and mold manufacturers, independent metal parts manufacturers, and specialized production application in aerospace, defense, medical equipment, energy, automotive/transportation, electronics, and computer industries. HURC sells its products through independent agents and distributors, as well as through direct sales personnel. Its F-Score (financial strength) at 7/9 is excellent, and it’s commensurately not financially distressed with a Z-Score of 4.65. With an M-Score of -2.76 it is also decisively not a manipulator. Insiders have typically been buyers over the last few years. HURC is an industrial technology company operating in a single segment. It designs and produces computerized machine tools, featuring its proprietary computer control systems and software, for sale through its own distribution network to the worldwide metal cutting market. The market for machine tools is international in scope. HURC has both significant foreign sales and significant foreign manufacturing operations. During fiscal 2014, approximately 62% of its revenues were attributable to customers in Europe, where it typically sells more of its higher-performance, higher-priced machines. Approximately 10% of its revenues were attributable to customers in Asia, where it sells more of its entry-level, lower-priced machines, and where it also encounter greater price pressures. HURC sells products through more than 100 independent agents and distributors in countries throughout North America, Europe and Asia. It also has its own direct sales and service organizations in China, France, Germany, India, Italy, Poland, Singapore, South Africa, the United Kingdom and certain parts of the United States. The vast majority of its machine tools are manufactured to primarily by its wholly-owned subsidiary in Taiwan, Hurco Manufacturing Limited (HML). Machine castings and components to support HML’s production are manufactured at its facility in Ningbo, China. During the third quarter of fiscal 2013 HURC acquired the machine tool component business of LCM S.r.l, an Italian designer and manufacturer of electro-mechanical components and accessories for machine tools. HURC uses LCM components in one of its lines of machining centers. HURC’s sales to foreign customers are denominated, and payments by those customers are made, in the prevailing currencies—primarily the Euro, Pound Sterling and Chinese Yuan—in the countries in which those customers are located. Its product costs are incurred and paid primarily in the New Taiwan Dollar and the U.S. Dollar. Changes in currency exchange rates will have a material effect on its operating results and consolidated balance sheets as reported under U.S. Generally Accepted Accounting Principles. For example, when the U.S. Dollar weakens in value relative to a foreign currency, sales made, and expenses incurred, in that currency when translated to U.S. Dollars for reporting in our financial statements, are higher than would be the case when the U.S. Dollar is stronger. 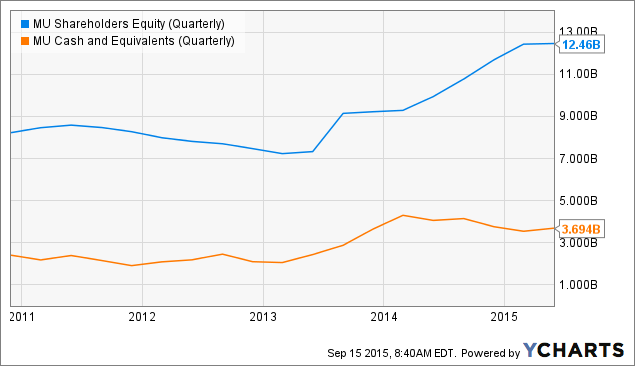 On an acquirer’s multiple of 5.4x, HURC is an attractively valued company. It will be beholden to the business cycle and its earnings are likely to be affected by the strength or weakness of the US dollar, but it looks like a good long-term bet because it is conservatively managed and has the potential for continued growth. This content is restricted to registered paid users who are logged in. Click here to register or log in. Christopher & Banks Corporation (NYSE:CBK) is another cheap, scary stock in the Small and Micro Cap Screener. With a market capitalization of $65 million, net cash of $36 million and operating earnings of $8 million over the last twelve months, CBK trades on an acquirer’s multiple of 3.73x, and a PE of 1.5x. It’s got an ugly -8 percent free cash flow / enterprise value yield, but has managed to buy back a paltry 0.7 percent of its stock over the last twelve months. CBK is a retailer of womens apparel and accessories in the United States, which is an industry I hate. In short, it’s as ugly as they get, which is why it’s as cheap as it is. The good news is that one of the shareholders has turned activist, and it might be ready for some life. …Christopher & Banks (NYSE:CBK) is finding some love. Macellum Capital owns about a 5.2% stake and has been active in the name since early April. It isn’t your typical activist, but it does know retail. Recall that it’s had success with effecting change at GIII, Hot Topic, Collective Brands, Children’s Place, etc. in the past. With a focus on women’s apparel, CBK is in the sweet spot of retail, as opposed to those targeting more fickle teens [read: Abercrombie, American Eagle (NYSE:AEO), etc.]. However, profitability has been in rapid decline, hence the massive sell-offs since October. Side note – Macellum pointed out that insiders were dumping the stock just before the huge sell-off in October, indicative of the fact that they aren’t confident of a turnaround anytime soon. The rapid decline in CBK’s stock comes as same store sales have gone from a positive 4.9% in 3Q13 to a negative 7.6% in 3Q14 and then a negative 7.5% in 4Q14. EPS consensus for 2016 is now in the tank, with 2016 consensus EPS going from 80 cents in 3Q14 down to 30 cents currently. We’re going to need a turnaround of large proportions. The company has been blaming issues on poor execution with local fashion shows (where it surprisingly derives a lot of its sales) as well as the port strike, which delayed merchandise deliveries. But other retailers haven’t felt the same pressure with port strikes. And the fact that it’s having trouble at fashion shows could be a bigger problem, where it’s losing touch with its customers. The thesis is to get new leadership in there, but it has already had four CEOs in the last five years. The board includes all Minneapolis-based business people, so some new blood is needed. Yet Macellum missed the deadline for nominating board members this year and the fund has never waged a proxy battle, either. If you were anywhere near finance twitter or television this week you’re aware that the markets are having a tough run at the moment. I’m trying to contain my excitement. Down 6 percent is really nothing. It only looks frightening because the markets have been so subdued for so long. I’d love another shot at a 2008 / 2009-type market, but that’s a few hundred points lower. In the interim, we can look for stocks that have already endured a long bear market and now trading way below intrinsic value. One such stock is Kulicke and Soffa Industries, Inc. (NASDAQ:KLIC). At $10.27, it is down almost 40 percent from its 52-week high, and seeing prices it last saw in 2013. It now trades on a market capitalization of $750 million, and an enterprise value of $274 million once its net cash of $476 million is backed out. It generated $74 million in operating earnings over the last twelve months, putting it on an acquirer’s multiple of 3.7x. It has a trailing PE of 11, and earnings FCF/EV of 14 percent. The company is taking advantage of its undervalued stock, and strong balance sheet: buying back 8 percent of its market capitalization over the last twelve months. KLIC’s down because its business is cyclical. It manufactures capital equipment and expendable tools to assemble semiconductor devices, including integrated circuits, discrete devices, light-emitting diodes (LED), and power modules. Its a safe company. KLIC’s F-Score at 6/9 is excellent, and it’s Z-Score 4.97 is well into safe territory. Its Beneish M-Score at -1.59 is slightly into manipulator territory (anything greater than -2.22 is more likely to be a manipulator). KLIC’s poor M-Score could be a product of a slowing business–many of the components of the M-Score are somewhat arbitrary and aimed at finding companies trying to keep up the appearance of high sales growth by cooking the books through deteriorating earnings and asset quality, increasing leverage, slowing depreciation etc. None of KLIC’s M-Score components stand out as an issue. It’s at the margin on each, but tripping the absolute score in aggregate. I don’t think it’s actually a manipulator, but would recommend keeping an eye on its M-Score at each report. In all, KLIC is a cheap, safe, cash-rich company buying back stock. It owns a cyclical business coming off a cyclical peak, and that’s why it’s cheap. To management’s credit the company has developed over the years with a focus on maintaining respectable operational efficiency metrics, although both the company’s TTM operating margin of 11.94% and TTM return on equity of 8.94% fall just short of the semiconductor equipment & materials industry averages. On an asset utilization basis; however, Kulicke and Soffa generates $0.12 more in revenue for every dollar in assets than the average company operating in the space. Meanwhile, the company’s balance sheet is impeccably strong with the company’s $475.9 million in cash and cash equivalents totalling nearly three times more than the company’s total liabilities. A total debt-to-equity ratio of 0.00 and a current ratio of 7.80 only reinforce the company’s superior balance sheet positioning. Looking back over recent history Kulicke and Soffa has been mixed in growing its top and bottom lines with the company having to deal with a massive drop-off in revenue and earnings in 2013. Moving forward analysts expect the underlying growth trends for the company to at the very least stabilize, with revenue expected to drop 2.1% in 2015 and return to 10.6% growth in 2016. On the bottom line EPS is forecasted to deteriorate from $0.81 in 2014 to $0.79 this year and $0.58 in 2016. The mixed picture of growth for Kulicke and Soffa is expected to result from the company’s large exposure to Asia. With 80% of the company’s overall sales coming from this region and most expecting at the very least a sizeable economic slowdown in this region this exposure is likely to be more of a growth hinderance than driver in coming years. Even with the recent slowdown in the semiconductor industry long-term the growth dynamics are in favor of Kulicke and Soffa. According to Gartner June 2015 projections the global semiconductor market will grow at a 9% compound annual growth rate on an unit basis and at a 4% compound annual growth rate on a revenue basis until 2019. Another major potential growth driver for the company comes in the form of its recent entrance into the advanced packaging market, which according to March 2015 projections by VLSI Research will grow at a 15% compound annual growth rate until 2019. With the company having only recently entered this market there also exists the potential for Kulicke and Soffa to gain significant market share. According to the above valuation profile Kulicke and Soffa trades at a steep discount to its industry peers on every displayed comparable basis. This depression in valuation is something that has long been characteristic of the company, but has recently been extenuated dramatically by the steep decrease in the company’s stock price. To put Kulicke and Soffa’s current valuation into perspective, it is worth noting that at current prices Kulicke and Soffa trades at 4.12x earnings less cash. While this specific metric has never climbed above 10 over the past half decade, the current level is certainly overly-punitive of Kulicke and Soffa’s business prospects. I see shares justified in trading as high as $15.80 (20 P/E ratio * 2015 EPS estimate) within the next year. Apollo Education Group, Inc. (NASDAQ:APOL) is one of those stocks that tests the patience of value investors. Like the rest of the for-profit education industry, it’s been in a tail spin for years. The problems are well known: For-profit educators exploited the torrent of government money available for higher education and loaded students with too much debt for jobs that held little prospect of repaying the loans. The government’s response has been to turn off the spigot by mandating colleges meet minimum levels of gainful employment and maximum debt-to-starting salaries. This has in turn led to declining enrolments, revenues, profits and a swathe of bankruptcies. Many long investors have put the industry in the too-hard basket for the massive regulatory risk it has attracted. Other have been short to the gills. Both have have been smart trades for going on ten years now. Several analysts on the investor call actually called Cappelli out on the fact that Apollo has been in constant turnaround mode under his current and former co-regime and that at some point The Street is going to wonder why anybody sane at the company hasn’t taken a look at “management”. Of course, Cappelli was quick to blame individual college Boards and individual college management teams. He then followed this passing of the buck by stating that Apollo would do anything to help these managers be successful. So who is minding the shop? Who is really running this show? I thought it was Cappelli. Maybe I’m wrong? The point is that Apollo is facing an incredibly tough uphill climb and it largely has nothing to do with Apollo’s University of Phoenix. Largely, for-profit educational institution is simply outdated. Still, there are things that can be done to evolve the model (as was suggested by an analyst on the call) and things than can be done to aggregate market share that is bleeding out of other players. Cappelli clearly doesn’t “get” any of these. If Apollo is to be saved it needs leadership that can take it through the most difficult transition the company has ever faced. This isn’t Cappelli and this isn’t the sitting board. I continue my call for the removal of both. Salazar is short, but might change his mind given a change in management. I have some sympathy for the view that out or short continue to be smart trades, but I think APOL is now simply too cheap to ignore. The numbers are eye-popping. With a market capitalization of $1.254 billion, and net cash of almost $900 million, APOL trades on an enterprise value of just $356 million. It generated operating earnings of $224 million in the last twelve months, putting it on an acquirer’s multiple of just 1.59x. A little over $119 million of the operating earnings are free cash flow, putting it on a FCF/EV yield of 33 percent. It’s used that cash flow to buy back 7.4 percent of its outstanding stock last year. Okay, that’s helpful. One other one on capital management. It sounds like you’re kind of shrinking the organization to the right size and there is a little bit of uncertainty over the next two years as you finish your plan of what that size is. Does this mean you’re going to shift away from repurchases and more towards acquisitions in say Apollo Global, as a use of capital over the next two years until you have a better idea of where the right size for the organization is? You know I didn’t say that. What I said is, given the circumstances we look at that capital every single quarter with our board, I think there are times when share repurchases have in the past and will continue to make sense. We look at sort of a pyramid of every dollar we use, whether it’s in global or, frankly, we are investing back into certain areas of our domestic operations or the B2B solutions which we have been spending some money on at, professional development as well, and we look at those returns sort of in order. And we do think that there is an appropriateness at certain times for share repurchases as well and that will continue to be part of the dialogue going forward. It’s hard for us to signal exactly how much we are going to spend and in what areas because we are not allowed to do that. But it certainly has been part of the conversation and is every quarter when we meet with our board. APOL really gets my gag reflex going. It’s been Waterloo for value guys for years now, and the short arguments sound smart. It’s also way too cheap. At these levels, it warrants a small position. I don’t currently hold it, but I’ll buy into it at the next rebalance date (October 1) if it remains in the screen. We were long cheap stocks and short expensive stocks, right in front of the worst period for value strategies since the Great Depression… Not long cheap stocks alone, which simply languished, but long cheap and short expensive! We remember a lot of long-only value managers whining at the time that they weren’t making money while all the crazy stocks soared. They didn’t know how easy they had it. In watching Gotham’s performance tail off this year — returns outperformed initially leading to big asset inflows — it’s hard not to wonder whether it reflects a similar bout of over-exuberance, or extreme overvaluation in some sectors. Gotham, through a spokesperson, declined to comment or give color to any particular sectors or stocks that have driven underperformance. However, a look through Gotham’s public filings indicates it has minimal exposure to the cratering energy sector, or on-the-ropes coal, commodities, and metals producers. The firm’s Absolute Return Fund reported a 15% exposure to the under-performing industrial sector, and an ownership of semiconductor stocks, potentially causing returns to tail off. A 5% exposure to healthcare has also likely missed the boat on this year’s M&A wave. But it is more likely that the short portfolio has driven underperformance, even in a flat market. Per Bloomberg data, it is the bubble-prone Internet sector that’s leading the S&P 500, gaining 57% year-to-date, followed by home entertainment systems and construction materials. Those three sectors would likely capture big 2015 winners such as Netflix NFLX +1.63% (up 133%), Amazon.com (up 73%), Martin Marietta Materials (up 42%), and Vulcan Materials (up 39%) — all of whom sometimes find themselves the target of short sellers, or bouts of overvaluation. Perhaps, Gotham’s performance indicates there’s a looming upward correction in industrial and semiconductor stocks and a downward move in high flying internet and social media stocks. After a rocky start to the first half of 2015, marked by a tumble in businesses sensitive to global commodity prices and economic growth, perhaps more challenges are in store if high multiple stocks also turn south. In that instance, expect Gotham to recover. The fund after all explicitly states its is likely to underperform broad markets over quarterly and yearly periods. “If there were an investment strategy that worked every day, every month and every year, eventually everyone would follow it and it would stop working,” Gotham states in its fund prospectus. “Though for months, quarters and even longer this strategy may underperform one benchmark or another, this is the only way we know how to invest. In fact, we strongly believe that short periods of underperformance are a major reason why more people do not adopt our logical, disciplined approach,” it adds, citing research that shows over the past decade 96% of the top quartile managers spent at least one three-year period in the bottom half of performance rankings, and 79% spent three years in the bottom decile of performers.